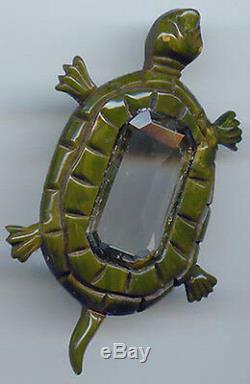 This vintage large marbled green Bakelite turtle pin has a faceted Lucite center. He has his original drilled-in pin back. The pin measures 2" (5.1 cm) by 3-1/4" (8.3 cm). A bit of glue can be seen around the edges of the Lucite. This tests positive for Bakelite with Simichrome. 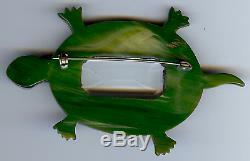 The item "LARGE VINTAGE MARBLED GREEN BAKELITE WITH LUCITE CENTER TURTLE PIN BROOCH" is in sale since Monday, March 26, 2018. This item is in the category "Jewelry & Watches\Vintage & Antique Jewelry\Costume\Bakelite, Vintage Plastics\Pins, Brooches".